[182 Pages Report] A gastrointestinal stent is a cylindrical medical device primarily used as a safe and effective alternative to surgery or repetitive endoscopic procedures to widen a narrow or stenosed lumen in order maintain the patency of the lumen. The gastrointestinal stent market is expected to reach USD 452.6 Million by 2022 from USD 337.5 Million in 2016, at a CAGR of 5.1% during the forecast period. The increasing preference for minimally invasive surgeries and rising prevalence of GI cancers and other digestive diseases are the major factors driving the growth of the global market. Boston Scientific (US), Cook Group (US), ELLA-CS (Czech Republic), Merit Medical Systems (US), Taewoong Medical (South Korea), Micro-Tech (China), and M.I. Tech (South Korea) are some of the key players in the global gastrointestinal stent market. Further breakdown of the Rest of Asia Pacific gastrointestinal stent market into South Korea, Australia, New Zealand, and others. Further breakdown of the Rest of Europe gastrointestinal stent market into Belgium, Russia, the Netherlands, Switzerland, and others. The global gastrointestinal stent market is projected to reach USD 452.6 Million by 2022 from USD 353.4 Million in 2017, at a CAGR of 5.1% during the forecast period. Market growth can be attributed to the growth in the geriatric population, increasing preference for minimally invasive surgeries, rising prevalence of GI cancers and other digestive diseases, and changing lifestyles. The report analyzes the global gastrointestinal stent market, by product, material, disease type, end user, and region. Based on product, the biliary stents segment accounted for the largest share of global market in 2016. This can be attributed to the high prevalence of pancreatic cancer and biliary diseases as well as the growth in the number of surgical procedures for the treatment of these diseases. Based on material, the self-expanding metal stents segment accounted for the largest share of the global gastrointestinal stent market in 2016. The large share of this segment can be attributed to their ease of insertion, a lower possibility of dislodgment or migration, its longer patency because of the large luminal diameters, high longevity, and large use of it in interventional endoscopy for various malignant obstructions. On the basis of disease type, the biliary diseases segment accounted for the largest share of the global gastrointestinal stent market in 2016. The large share of this segment is attributed to the high prevalence of gastrointestinal diseases in the elderly population. The global gastrointestinal stent market, by end user, is segmented into hospitals and ambulatory surgery centers. In 2016, the hospitals segment accounted for the largest share of the market. The large share of this segment can be attributed to the large number of endoscopic procedures performed in hospitals for various gastrointestinal diseases. 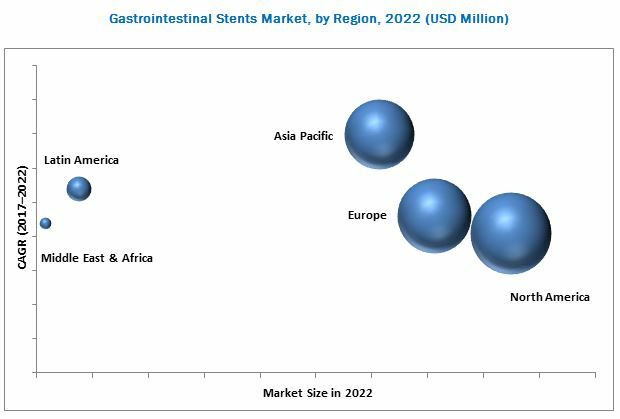 Geographically, the global gastrointestinal stent market has been segmented into five major regional segments North America, Europe, Asia Pacific, Latin America, and the Middle East & Africa. In 2016, North America accounted for the largest share of the global market in 2016, followed by Europe and Asia Pacific. The highly developed healthcare system, rising geriatric population, growing adoption of technologically advanced stents, and the presence of key players are the major factors responsible for the large share of North America in the global market. The major complications associated with the implementation of gastrointestinal stents include stent misplacement or displacement, bleeding, obstruction, perforation, stent fracture or collapse, and infection. Bacterial colonization is a major factor leading to plastic stent occlusion, which results in sludge formation and luminal obstruction. Covered gastrointestinal stents generally prevent obstruction from tumor ingrowth with a covering membrane but have a higher migration rate. These complications associated with gastrointestinal stenting are limiting their adoption. The prominent players in the global gastrointestinal stent market are Boston Scientific (US), Cook Group (US), C.R. Bard (US), ELLA-CS (Czech Republic), Becton, Dickinson and Company (US), Merit Medical Systems (US), CONMED (US), Cantel Medical (US), Olympus (Japan), Taewoong Medical (South Korea), Micro-Tech (China), Endo-Flex (Germany), M.I. Tech (South Korea), and Diagmed Healthcare (UK). Boston Scientific Corporation (US) dominated the global gastrointestinal stent market in 2016. The company focuses on increasing its share in the market by strategically investing in R&D; activities. For instance, in 2016, the company invested USD 920 million in R&D;, as compared to USD 876 million in 2015. The company’s focus on improving its speed and performance through new capabilities, processes, and advanced innovative technologies; its expanding commercial presence globally; and its cost-reduction initiatives help it to accelerate its growth in the market. In 2016, the company’s revenue reported a growth of 12% as compared to the previous year. The company is also focusing on expanding its business in emerging countries. It reported a growth of 22% in its annual revenue in China, which is one of the largest emerging markets in the developing world.